A complex product which requires a high level of understanding from clinical practitioners who may recommend use of AlignTech products to their patients. 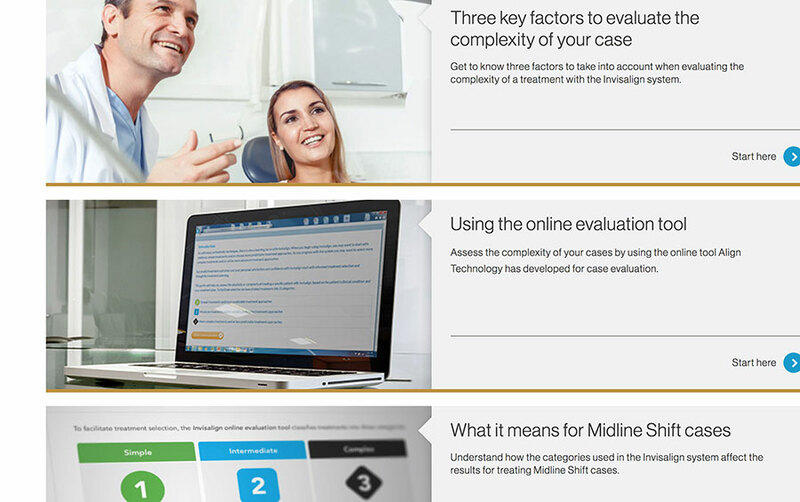 A scalable learning solution supporting AlignTech’s global education programme, showcasing how successful patient outcomes can be delivered with AlignTech orthodontic products and services. We developed content templates and workflows for 20 learning journeys covering 380 screens of specialist content for healthcare professionals localised into 10 languages. We supported AlignTech by putting into place collective ways of working between multiple AlignTech teams with delivery management at a wider programme level. The platform has transformed the learning experience AlignTech delivers. It has successfully enhanced clinical practitioners' skills and confidence with both Invisalign tools and techniques. With great reviews and positive feedback, it has been a gamechanger across multiple languages and global business units.